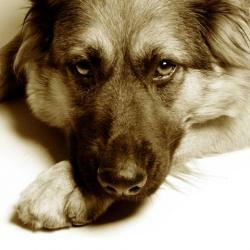 Disciplining a submissive dog is very tricky, and you can ruin your dog's temperament if you don't do it right. Find out why the Dog Expert recommends firm-but-gentle training techniques combined with praise for good behaviors to teach a dog and earn its trust. We've just adopted an eight-month-old German Shepard/hound mix and are having a hard time with discipline. He's very mellow, and when he does something wrong (like tearing the screen in the door) he lays down on the floor on his back, and it is hard to discipline a dog that seems to be scared. I don't want to turn him into a neurotic dog, but I really need to let him know when he does something wrong. What is the proper way to discipline a submissive/scared little dog? I'm curious to know why this young dog is already so submissive. Do you know anything about his background before you adopted him? It could give you valuable insight on how he was disciplined prior to your taking him, so you could avoid actions that trigger his distrust/fear. That being said, tone of voice goes a long way in disciplining a submissive dog. Try scolding him in a low, firm tone for unacceptable behavior. Speak strongly, but there's no need to shout. You should also know that unless you've caught him in the act, he may not connect the scolding to his actions. So, it's important to monitor him and give the correction immediately when he does something wrong. Just as important, offer him praise and affection when he behaves appropriately. In this manner, you gain his trust. I'd like to recommend that you get him out for some socialization. Dog obedience classes would offer a great way for the two of you to bond and develop communication skills while teaching your dog some useful commands. You might also find our article on Dog Clicker Training useful. So, that's my suggestion. Firm, but calm, vocal discipline combined with praise for things done right to build his trust in you and obedience classes to help him build social skills and confidence. Let us know how he progresses in the months to come, and thanks for your question. I have a one-year-old Australian Shepherd who has grown up in a pack of three other dogs. Our family of four also includes two cats. She has never shown fear or aggression to any human being or to the other dogs in her pack. She is actually submissive to them. She also seems afraid of one of the cats. Whenever my dog meets another dog, no matter the age or the personality, she is fearful of that dog. She was even fearful of two small puppies who only wanted to play. She tries to escape, but does not try to bark, bite, or growl at the other animals. I really want to try to break my dog of this behaviour. She loves to climb and jump on high things and I had hoped to enter her in agility trials. This isn't possible with her current fearfulness. Do you have any suggestions on how to retrain her so she does not fear other dogs. She is not generally a fearful dog. I was thinking about trying one of the doggie day cares for a couple of hours a week to see if this would help her out. Sounds like you have a busy household! Let's talk about canine behavior. Everyone has their place in the pack hierarchy and your dog's submissive nature places her at the bottom of the group. She also seems to view herself as submissive to every other creature she meets. Although there are a good number of pets and people in your household, I'm wondering just how much you were able to take her out and about during her early puppyhood? This kind of wider exposure is crucial for a pup's all around social development and might explain why she doesn't readjust her submissiveness when she relates to pets and people outside of the home. I think your idea of enrolling her in doggie day care is a great one. It would give her the opportunity to socialize with a wide range of dogs under the supervision of trained staff. You might not see an immediate change, but I believe you should eventually see some improvement. Will she ever have the kind of nerve and drive it takes to be an agility dog? I really can't say. I'd begin with the day care and take it a step at a time. Even if she never progresses to that point, she still sounds like she has a definite niche in your home. Just love her no matter how it all turns out.